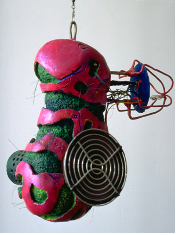 Amy Youngs’ Engineered for Empathy was inspired by the creation of transgenic tobacco plants that glow with the genes of fireflies. 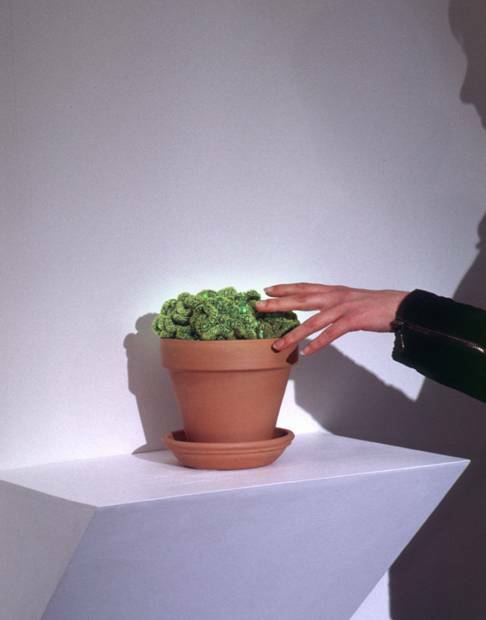 In the work below, Amy Youngs endowed a cactus with a pulsating glow. However, instead of using bio luminescence, she embedded LED’s in a live cactus. As you approached this work, the electrical charge of your body, (capacitance) caused the LED’s to flash more quickly. Engineered for Empathy by Amy Youngs, 1999 , 24" x 19" x 12" The Quantum Research Group. 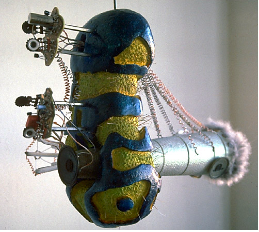 The Cyber Squeaks by Ken Rinaldo (1989-92), shown below, were a series of electronic sculptures that spoofed the emergence of machine intelligence. In these works, electronics integrated with life-like forms have begun to squeak their first words, in their own language. With photo resistors transistors, and mercury switches, they responded to human touch and a changing light environment, which induced them to emit emphatic squeaking sounds. 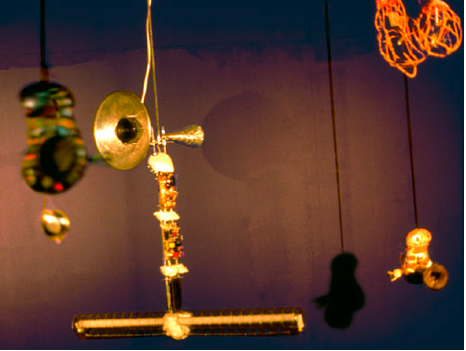 In a normal installation of these works, 15-20 of them would be hanging from springs from the ceiling. When touched, triggering a mercury switch these light sensitive creatures would squeak on an off. A fluorescent light integrated in the form of one of the Cybersqeeks was turned off and on and this caused the sound of the other Cyber Squeaks, which were light sensitive, to change and become lower in tone as they continued to squeak and burp their sounds. In these works, LEDs were connected to fiber optics that sprouted from the pieces as thin, glowing hair. When the works were activated by human touch, the LEDs would turn on, causing the fiber optics to glow red and green and later blue. Cyber squeeks in motion at Image du Future by Ken Rinaldo 1988-1992. If you are pursuing the Arduino then continue to the next section by hitting the next arrow below. If you are pursuing the Miditron then continue to that section by hitting the arrows below. If you are using the BS2 microcontroller, then continue by clicking on the chapter 6 in the index and going to Stamp 2 lessons.